President Elect's final and official projection of the 2004 Electoral College vote pitting President George W. Bush against the Democratic nominee, John Kerry, shows that Bush will become the first popular vote losing president to win a second term. President Elect projects that President Bush will win 286 electoral votes and Senator Kerry will win 252. Note that there are still several very plausable tie scenarios in the above map! - Switch Florida to Kerry and Wisconsin to Bush to get 269-269. - Switch Iowa to Kerry and Minnesota to Bush to get 269-269. - Switch Iowa and Ohio to Kerry and Wisconsin to Bush to get 269-269. - Switch Iowa, New Mexico, and Nevada to Kerry to get 269-269. President Elect's latest analysis of the 2004 Electoral College vote pitting President George W. Bush against the Democratic nominee, John Kerry, shows that if the election were today Bush would be the first popular vote losing president to win a second term. President Elect predicts that President Bush would win 276 electoral votes and Senator Kerry would win 262 (Kerry led 272-266 on 10/24/2004). - Last week I said "Wisconsin seems to be falling into Kerry's hands and will probably stay there for good". I now have to eat those words! - The biggest surprise from a historical point of view? Bush leading in Hawaii!? Since the Democrats have won Hawaii ever since they were granted electoral votes over 40 years ago (except for the Nixon and Reagan landslides in 1972 and 1984), I just can't color that state a red hue yet! - Look for these states to be the key to presidency: Florida, Iowa, Minnesota, New Hampshire, New Mexico, Ohio, and Wisconsin. - The final analysis will be November 1. President Elect's latest analysis of the 2004 Electoral College vote pitting President George W. Bush against the Democratic nominee, John Kerry, shows that if the election were today Bush would continue the trend of popular vote losing presidents failing to win a second term. 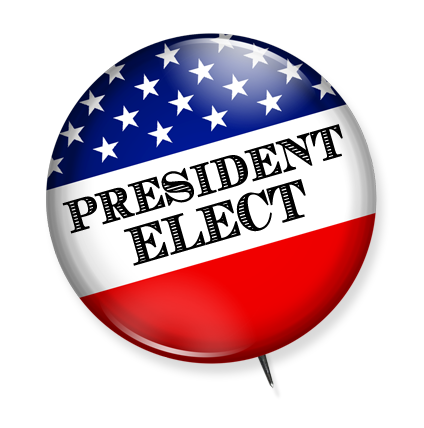 President Elect predicts that John Kerry would win 272 electoral votes and President Bush would win 266 (Bush led 274-264 on 10/17/2004). - For the first time since the start of the 2004 analysis Kerry has taken the lead. - Nevada and New Jersey seem to be falling into each candidates' camp solidly. - Last week I said "Wisconsin seems to be falling into Kerry's hands and will probably stay there for good". I may have to eat those words when the next analysis comes out! - With things still this volitale 9 days before the election, the presidency is up for grabs. - This map will be updated on: October 27 and November 1. President Elect predicts that President Bush would win 274 electoral votes and Kerry would win 264 (Bush led 288-250 on 10/12/2004). - Wisconsin seems to be falling into Kerry's hands and will probably stay there for good. New Hampshire has, once again flip-flopped, and in a close election could be a big factor. - Things are not all bad for the president. Four states are inching back towards the right - but not enough to change them in the current analysis. If they are going to truely continue their trend that way, don't be surprised to see a slight shift back to Bush in the next update. - This map will be updated on: October 24th, and 31st. President Elect predicts that President Bush would win 288 electoral votes and Kerry would win 250 (Bush led 305-233 on 9/16/2004). - As expected, the race for the White Hose is concentrated in a few key states - and those states are very fluid right now. Three of the states that changed in this analysis also changed in the last analysis! - This map will be updated on: October 17th, 24th, and 31st. President Elect predicts that President Bush would win 305 electoral votes and Kerry would win 233 (Bush led 274-264 on 8/29/2004). - A surprisingly volatile map, and obviously a bad map for Kerry. The past two weeks have seen a major shift towards Bush. One guess as to why this has happened is that a lot of previously undecided voters may be starting to switch to the Bush column. Kerry's troops shouldn't give up hope yet! There is a lot of time left and a lot of action to come, including the debates. And Pennsylvania and Wisconsin are close enough that they will almost certainly switch sides again and again during the next month and a half. President Elect's latest analysis of the 2004 Electoral College vote pitting President George W. Bush against the now offical Democratic nominee, John Kerry, shows that if the election were today Bush would be the first popular vote losing president to win a second term. President Elect predicts that President Bush would win 274 electoral votes and Kerry would win 264 (exactly the same as July). While the totals are the same from our previous anlaysis, there were some changes. - The leaning states of Colorado, Iowa, and Wisconsin are very fluid right now. Any given week may see these states flip-flopping between the two candidates. - CNN just might be counted among our readers! Their current analysis shows Bush and Kerry winning the same states listed above. President Elect's seventh analysis of the 2004 Electoral College vote pitting President George W. Bush against the now offical Democratic nominee, John Kerry, shows that if the election were today Bush would be the first popular vote losing president to win a second term. President Elect predicts that President Bush would win 274 electoral votes and Kerry would win 264 (Down from 279-259 in September). - As has occured in the past several maps we have done, things are not trending well for the president. - Look for President Elect's full 2004 election coverage (including our computer analysis of the election) to begin in August! President Elect's sixth analysis of the 2004 Electoral College vote pitting President George W. Bush against the all but offical Democratic nominee, John Kerry, shows that if the election were today Bush would be the first popular vote losing president to win a second term. President Elect predicts that President Bush would win 279 electoral votes and Kerry would win 259 (Down from 286-252 in September). - All changes in current map are in Kerry's favor. - For the first time in President Elect 2004 coverage, the Democrats have more solid electoral votes than Bush. PLEASE NOTE: There is an error on the above map. New Mexico should be colored light blue placing it in the LEANING BUSH column. The numbers are correct - only the map color is wrong. President Elect's fifth analysis of the 2004 Electoral College vote pitting President George W. Bush against the probable Democratic nominee, John Kerry, shows that if the election were today Bush would be the first popular vote losing president to win a second term. President Elect predicts that President Bush would win 286 electoral votes and Kerry would win 252 (Down from 307-231 in September). For several months of there has been continuous coverage of the Democratic caucuses and primaries, with little coverage of Republican re-election efforts. As expected, the Democratic nominee's poll numbers have started to reflect the bounce historically received by the party getting the lion's share of the coverage when the incumbent does not have to campaign to win his party's nomination. However, Kerry's support is strengthening because rank and file Democrats have been yearning to get behind a single person who would lead the charge against Bush. The SOLID KERRY states are solidifying behind him, while the LEANING BUSH and LEANING KERRY states are moving more in that direction. In our last analysis, one of Bush's problems was that his LEANING states weren't traditionally Republican friendly. With Massachusetts Senator Kerry as the probable Democratic nominee that problem may even out. He may lose LEANING states north of the Mason-Dixon Line but those south of it will start leaning back Bush's way. This analysis is just a starting point, since it is the first to seriously consider Kerry as the nominee. BTW - for those curious: This analysis was delayed in the hopes that a Democratic frontrunner would emerge so we wouldn't have to guess or do another generic assessment. However, just to be ready, preliminary analyses were done of several other candidates. For curiosity's sake, here are how those prelim numbers were looking. President Elect's fourth analysis of the 2004 Electoral College vote pitting President George W. Bush against an unnamed Democratic frontrunner shows that if the election were today Bush would be the first popular vote losing president to win a second term. The President's poll numbers have started to slide as the election season begins to get into gear. Some might argue that this drop is due to job performance but it is most likely the usual drop incumbents face when their potential opponents begin to campaign. Most of the states that have moved towards the Democrats in this analysis were states that Gore won in 2000, which tends to corroborate that idea. There is good news and bad news for the Democrats. The good news for the Democrats is that eight of the nine states that shifted from the previous analysis shifted toward them. Florida, Louisiana, and Ohio (worth 56 electoral votes) move from the SOLID BUSH to the LEANING BUSH column. New Hampshire and Wisconsin (worth 14 votes) move from the LEANING BUSH to the LEANING DEMOCRATIC column. New York, Oregon, and Washington (worth 49 votes) move from the LEANING DEMOCRATIC to the SOLID DEMOCRATIC column. Only Connecticut moves to the right in this analysis, but even it remains in the LEANING DEMOCRATIC column. That's 119 electoral votes moving towards the left! With 231 electoral votes, the Democratic candidate is only 39 votes away from winning in 2004. The bad news for the Democrats is that they are 39 votes away from winning. The electoral map above is the map President Elect believes will be the foundation for the 2004 election. The SOLID states will not budge from now until then (barring some unforeseen extraordinary event). The election will play out in the 14 LEANING states, which represent 162 electoral votes. Of the 231 Democratic electoral votes, only 164 are considered SOLID. While this is a big improvement from the previous analysis, it means they will have to win 106 of the 162 LEANING votes to win. The current analysis only has them winning 67. The good news and the bad news for Bush is more clear cut. The good news is all Bush has to do is maintain what he has to win. With 212 SOLID votes, the Republicans are in a much better position than the Democrats, needing only 58 of the 162 LEANING votes to win. The bad news is that most of Bush's LEANING states are not particularly known as friendly Republican states. Iowa and Pennsylvania (now worth 28 votes) voted for Gore in 2000. West Virginia (worth 5 votes) is a traditionally Democratic state. Former President Clinton could hurt the Republicans in his home state of Arkansas (worth 6 votes). And we all remember what happened in Florida (worth 27 votes)! So in our last analysis before 2004 begins where do things stand? While President Bush has the edge, he by no means has a clear cut victory ahead. The Democrats may need some help, and the LEANING Bush states just might provide it. In other words, it ain't over yet! Political junkies are in for an exciting election - again! PLEASE NOTE: Wesley Clark joined the race too late to be included in this analysis. The next analysis will be posted in January 2004. In December, look for our next poll asking who the Democratic candidate facing Bush should be. President Elect's third (subjective, but always educated) analysis of the 2004 Electoral College vote pitting President George Bush against Democrat Howard Dean (the candidate our readers chose in a March and May poll as the most likely Democrat to win) shows that if the election were today Bush would be the first popular vote losing president to win a second term! After the surprising Republican victories in the 2002 mid-term election and coming off a successful military campaign in Iraq, the President's approval numbers remain strong. Howard Dean, former governor of Vermont, seems at the same time an odd choice and the perfect choice to put against the popular President. He's brash, blunt, and extremely opinionated. While he is fiscally moderate, most of his social beliefs are on the left side of liberal. As he tries to capture the nomination there are two issues that could hurt him with voters on both sides of the Democratic party spectrum. Liberal Democrats may be uncomfortable with his views on gun control, where he stands firmly with the NRA. Moderate Democrats may be uncomfortable with his views on gay rights; as governor, he signed the law that made Vermont the first state to recognize civil unions for gay couples. The biggest issue separating Bush and Dean is the recent Iraq war (Dean was the first Democratic candidate to come out strongly against it), and that could be the critical issue in an election between these two. However, Bush's popularity seems tough to beat right now. As history has shown, as we approach the election his numbers will inevitably drop. But the Democratic candidates don't seem to be resonating with the public yet. A poll released in May 2003 asking respondents to name any Democratic presidential candidate found that 66% of the public couldn't name any of them - and Dean was only named by 1%. President Elect predicts that President Bush would win 321 electoral votes to the Howard Dean's 217. However, of all the current Democratic candidates, we believe Dean has the greatest chance of turning these numbers around and surprising everyone. After all, it wouldn't be the fist time an unknown Democratic governor of a small state took on a popular President named Bush who had just invaded Iraq - and won! The next analysis will be posted in September 2003. President Elect's second (subjective, but educated) analysis of the 2004 Electoral College vote pitting President George Bush against Democrat Al Gore (the candidate our readers chose in a July poll as the most likely Democrat to win) shows that if the election were today, Bush would be the first popular vote losing president to win a second term! Arkansas - moves from the "leaning Gore" column to the "solid Gore" column (+/- 0). Florida - moves from the "leaning Gore" column to the "leaning Bush" column (+27). Georgia - moves from the "leaning Bush" column to the "solid Bush" column (+/- 0). Minnesota - moves from the "leaning Gore" column to the "leaning Bush" column (+10). What this shift of 37 votes really shows is just how volatile some of the leaning/toss-up states are. Even with Bush's larger lead, things are actually closer than they seem. Regional issues in key states could decide the election. The next analysis will be posted in May 2003. . Yes, you see those numbers on the map correctly -- and no, we didn't plan it that way! President Elect's (subjective, but educated) analysis of the 2004 Electoral College vote pitting President George Bush against Democrat Al Gore (the candidate our readers chose in a July poll as the most likely democrat to win) shows that if the election were today, we might see the first tie since 1800! For Gore - if he had won the states our analysis gives him during the 2000 election he would now be president by a vote of 272-266. For Bush - the changes in the allocation of electoral votes for the 2004 election favor the Republicans more than the Democrats -- if the new numbers had been in effect in 2000, Bush would have won seven more electoral votes. The next analysis will be posted in November 2002 -- after the mid-term elections.